Matthias Schulze and Volker Pfeufer, Coherent Inc. The growth in applications of various superresolution microscopy and nanoscopy techniques is driving a demand for small continuous-wave lasers with higher power and new wavelengths. This is the first in a two-part series on lasers for microscopy applications. Since the first confocal microscope, lasers have been important illumination sources for cutting-edge microscopy techniques based on fluorescence. As these techniques have evolved, laser manufacturers have worked closely with microscope manufacturers and users to provide lasers whose output is well-matched to the specific needs. The latest trends involve optical nanoscopy and multiwavelength excitation. Thanks to optically pumped semiconductor laser (OPSL) technology, lasers ideally suited for these applications are now available. Successfully answering many important questions about biomedicine – on topics ranging from morphogenesis to drug discovery and disease pathology ­– requires the ability to relate chemistry at the molecular level to biology at the subcellular, single-cell and complete-organism levels. To better understand the connection between single-molecule events and macroscopic structure and dynamics, researchers now are increasingly using a growing number of superresolution microscopy or nanoscopy methods that surpass the classical diffraction limit on spatial resolution. Traditionally, optical microscope resolution was limited by diffraction, resulting in a best case for spatial resolution of about half the wavelength of light (i.e., for visible light, approximately 200 to 250 nm in the X-Y plane); in the case of confocal microscopy, this is about 500 nm in the Z-direction. Unfortunately, this is larger than many of the detailed structures that biologists want to investigate, thus limiting the ability to connect the molecular and microscopic/macroscopic realms. In recent years, techniques have been developed to get past this limit; today, systems can achieve image resolution as fine as 20 nm and better. All optical superresolution or nanoscopy techniques are based on the principle of optically and reversibly preparing states of a fluorescence label that differ in their emission characteristics (e.g., a bright “on” and a dark “off” state). Based on their different mechanisms for this on/off photoswitching, optical nanoscopy methods can be loosely divided into two groups: those that directly improve microscope effective spatial resolution by deterministic photoswitching in space and time, and those that achieve the higher resolution by stochastically switching single-molecule fluorescence on and off in space. Examples of the first group include stimulated emission depletion (STED) microscopy, ground-state depletion microscopy, reversible saturable optical fluorescence transition (RESOLFT) microscopy or parallelized RESOLFT microscopy, often denoted nonlinear or saturated structured illumination microscopy. Examples of the latter include direct stochastic optical reconstruction microscopy (d-STORM) and fluorescence photoactivation localization microscopy (f-PALM). Figure 1. Principles of STED: (a) schematic drawing of the setup of a STED nanoscope with phase plate, objective lens dichroic mirror (DC), fluorescence filter (F), detector, scanning device, and excitation and STED lasers with their focal intensity distribution (right) and a representative, subdiffraction-sized observation area. (b) STED nanoscopy is based on inhibiting fluorescence emission by de-exciting the excited S1 “on” state to the S0 “off” ground state via stimulated emission. Increasing the power of the STED laser drives the inhibition into saturation. (c) Combined with an intensity distribution that features at least one intensity zero, this on/off fluorescence inhibition realizes subdiffraction-sized observation volumes: The volume in which fluorescence emission is still allowed (green, insets) decreases with increasing STED laser power. Courtesy of Christian Eggeling of the University of Oxford, England, and Katrin Willig and Alf Honigmann of the Max-Planck Institute for Biophysical Chemistry, Göttingen, Germany. A widespread nanoscopy approach is STED, since it is flexible, fast and basically applicable to any fluorescence label. Here, usually a TEM00 laser beam is focused to a diffraction-limited Gaussian beam waist using an objective with a high numerical aperture. Its wavelength is chosen to be near the absorption maximum of the target fluorophore. A second, longer-wavelength laser beam is transformed so that it has at least one intensity zero such as a donut cross section. This second STED beam is focused into the sample co-linearly with the first. Its purpose is to deplete the population of excited fluorophores by stimulated emission, before they have time to spontaneously fluoresce. It thus darkens a specific area of the observed region of the sample. As the power of the STED beam is increased, the area that it affects expands, thus constricting the observed fluorescence to a spot much narrower than the diffraction limit (Figure 1). 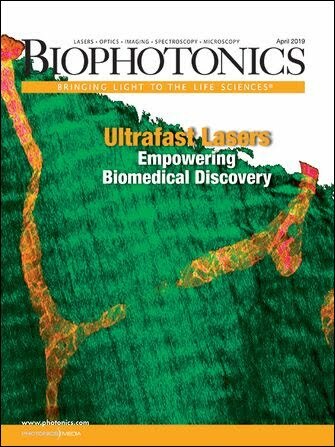 Pioneered by Stefan Hell and colleagues,1 gated STED using CW pulsed lasers enabled the acquisition of super-resolution images with lower peak power and minimized photodamage.2 This opened a route to live-cell imaging at (to date) down to 40- to 50-nm resolution. An example of the effectiveness of gated STED can be seen in Figure 2. Figure 2. The effectiveness of STED is clear in this pair of images of fluorescently tagged microtubuli in mammalian cells using a 577-nm Coherent Genesis laser to drive the STED effect: conventional confocal (left) and gated STED image (right). Courtesy of Dr. Giuseppe Vicidomini and professor Alberto Diaspro, Istituto Italiano di Tecnologia (IIT); source: G. Vicidomini et al (2013), Gated CW-STED microscopy: A versatile tool for biological nanometer scale investigation. Methods, doi: http://dx.doi.org/10.1016/j.ymeth.2013.06.029. With stochastic-based techniques like f-PALM and d-STORM, one laser is used to stochastically drive fluorophores between the “on” and “off” states, so that only a very small, random subset of well-separated molecules is in its “on” state and available to be excited by a second laser. The fluorescence spread from each of these camera-imaged point sources is then analyzed to find the centroid – i.e., the point source or spatial localization, based on the point spread function of the microscope. Repetitive on/off switching brings up different random subsets in subsequent camera images for single-molecule localization. After many cycles, the microscope computer assembles all the idealized point sources into a subdiffraction image, since the localization of a single molecule can be performed with high, subdiffraction spatial precision. These optical nanoscopy techniques are creating a need for low-noise CW lasers with higher power. In the case of the fluorescence-excitation laser, higher power can enable increased signal-to-noise for the resolution-sharpening techniques resulting in faster imaging. Higher power is even more of a requisite for the laser used to provide the superresolution-inducing effect. Specifically, powers in the 1- to 3-W range are needed for STED, and typically a few hundred milliwatts for PALM and STORM. These numbers are based on the typical experimental overhead and losses between the laser itself and the actual sample. And in the case of structured illumination microscopy, microscope manufacturers are looking to move up to 300-mW lasers to decrease image acquisition times, whereas early users of this method worked with as little as 100 mW. Power adjustment is also necessary because the resolution enhancement is usually power dependent. For example, in the case of STED, increasing the power of the STED laser constrains the fluorescence excitation to an ever-smaller volume – i.e., higher resolution. In the case of STORM, it is essential to balance the density of fluorophore doping and the power of the activation laser to get an optimal density of single-point emitters in each frame. These requirements are being met by lasers based on OPSL technology, such as the Sapphire and Genesis series from Coherent. For example, products having up to 3 W of output power were recently introduced specifically to meet the growing needs of superresolution microscopy. Moreover, output power for these lasers can be smoothly adjusted between 10 and 100 percent of maximum with no effect on output beam characteristics. OPSL technology is easy to power-scale because of the absence of thermal lensing in the thin semiconductor gain chip. Diode-pumped solid-state lasers are also used for microscopy, but their power-dependent thermal lensing makes it difficult to adjust power without compromising the beam quality, shifting the beam direction and changing its divergence. These lasers would therefore require the cost and complexity of some type of variable attenuator to be used with most nanoscopy techniques. Another key trend is the growing demand for “new” laser wavelengths, and particularly longer wavelengths, to optimally excite many of the new fluorophores. These include the mFruit series of fluorescent proteins and a host of new green, yellow and orange excited dyes originally developed for multichannel flow cytometry applications. These fluorophores are valuable alternatives to older fluorophores such as GFP (green fluorescent protein). And, as with wide-field microscopy, new nanoscopy methods often use combinations of multiple fluorophores to permit simultaneous mapping or probing for more than one type of structure or biochemical (Figure 3). Figure 3. Synapses at neuromuscular junctions from Drosophila melanogaster stained for bruchpilot of the presynaptic active zone (false-colored in green), glutamate receptor of the postsynaptic membrane (false-colored in red) and presynaptic membrane (false-colored in blue). Shown are the structured illumination microscopy image, left, and the wide-field image, right. The insets are magnified views of the boxed regions. Courtesy of Jan Pielage, Friedrich Miescher Institute, Basel, Switzerland; imaged on a Zeiss Elyra S.1. Fortunately, wavelength scalability is another key advantage of OPSL technology; lasers can be fabricated for any arbitrary output wavelength across much of the visible and near-UV spectrum, merely by tweaking the design of the gain semiconductor chip. For example, new lasers at 588 nm and 594 nm were recently introduced for exciting orange fluorophores. Other models at 550 nm have also been developed, as this wavelength can be used to simultaneously excite green dyes and several new yellow fluorophores with a single laser. Yet another new OPSL wavelength is 568 nm, designed to provide the first solid-state replacement of krypton ion lasers formerly used at this wavelength. In contrast, diode-pumped solid-state lasers can reach only a few fixed wavelengths and often rely on complex frequency-mixing schemes that can add cost and potentially reduce reliability. And, although a growing number of visible wavelengths can be obtained directly from laser diodes, these do not have the power or beam quality to support demanding optical nanoscopy methods. Fiber delivery of laser light is another trend common to all types of laser microscopy, not just optical nanoscopy methods. Fiber delivery allows the laser(s) to be placed away from the microscope, which simplifies mechanical design and thermally decouples the microscope from the laser. In addition, single-mode, polarization-preserving fiber acts as an extended spatial filter, yielding a perfectly round Gaussian beam from its output facet. In contrast, using macroscopic optics for beam delivery can lead to beam distortion, astigmatism and other compromises in original beam quality. The traditional approach for OEMs and end users was to couple the laser into the single-mode fiber using mounts with up to 6° of freedom that had to be individually optimized and then locked. Because the fiber core diameter was only 3.5 µm, the process required an experienced user and could take tens of minutes, often resulting in a non-optimum alignment. Moreover, the final alignment was vulnerable to creep and misalignment due to vibrations or changes in ambient temperature. In response, some laser manufacturers began to offer laser heads that were fiber-pigtailed at the factory. However, these products had lifetimes as short as hundreds of hours, because as lasers were pushed to higher power, the small dimensions of the input and output facets led to deterioration and early failure, meaning the entire laser/fiber component would have to be replaced. Also, the coupling efficiency could often change with operating temperature in these earlier laser/fiber assemblies, meaning loss of output power and a reduced polarization extinction ratio. And temperature changes during transport or operation could even result in a permanent misalignment/detuning of the laser. A special fiber now solves the longevity problem; its input and output facets are significantly larger than conventional single-mode fiber, yet it still functions as single-mode and polarization-preserving. As a result, fiber-coupled lasers using this fiber exhibit typical lifetimes of 10,000 hours or more, even at the multiwatt power level. Just as important, in the latest fiber-coupled CW lasers for microscopy, this fiber is brought directly into the heart of the laser, where it is permanently fixed, eliminating the cost of multiaxis, multiangle mounts and their potential for long-term loss of optimum alignment. With both conventional and optical nanoscopy techniques now often using multiple excitation lasers, instrument builders and end users are increasingly faced with the major challenge of combining multiple fiber-coupled lasers. The stringent optomechanical requirements for single-mode fiber beam coupling have traditionally made combining multiple fiber-coupled lasers a complex task. Typically, this necessitated the cost and complexity of aligning collimating lenses, dichroic beamsplitters, polarizers and wave plates at each successive laser wavelength. Figure 4. The Obis Galaxy fiber combiner from Coherent uses eight wavelength-dedicated plug-and-play input sockets to combine multiple lasers in a single output fiber. Courtesy of Coherent. A new plug-and-play combiner, the Obis Galaxy from Coherent, simplifies this problem. This passive device can integrate up to eight different laser wavelengths using a patent-pending combination of a minimum number of refractive optical components, together with a novel fiber having constant numerical aperture over the entire 405- to 640-nm range. This reduces the task to simple plug and play with snap-in (FC/UFC) fiber connectors. Matthias Schulze is director of marketing in the life sciences at Coherent Inc. of Santa Clara, Calif.; email: matthias.schulze@coherent.com. Volker Pfeufer is a senior product line manager at Coherent; email: volker.pfeufer@coherent.com. The authors wish to acknowledge the assistance of Dr. Christian Eggeling (principal investigator at the Human Immunology Unit and scientific director at Wolfson Imaging Centre at Weatherall Institute of Molecular Medicine at the University of Oxford) in the form of personal communications about optical nanoscopy techniques and specifically the STED technology. 1. S.W. Hell (2007). Far-field optical nanoscopy. Science, Vol. 316, pp. 1153-1158. 2. G. Vicidomini et al (2011). Sharper low-power STED nanoscopy by time gating. Nat Methods, Vol. 8, pp. 571-573.